Today’s topic is: M*A*S*H spin-offs you wish had happened. Igor the Pig Farmer? Rizzo’s Breeding Frogs? M*A*S*H produced one true spin-off, a sequel and continuation called AfterMASH. It starred Harry Morgan, Jamie Farr, and William Christopher. The sitcom ran for 30 episodes on CBS between 1983 to 1985; a 31st episode never aired in the United States. A second potential spin-off called “W*A*L*T*E*R” starring Gary Burghoff never got past the pilot stage. It aired on CBS in July 1984. While M*A*S*H was on the air, CBS tried twice to create a sitcom about a group of nurses stationed in Korea during the Korean War. The network aired two pilots but decided against picking either up as a weekly series. The first pilot, called “Handle with Care,” aired in May 1977. Marlyn Mason, Didi Conn, and Mary Jo Catlett starred. The second pilot, titled “The Fighting Nightingales,” aired in January 1978. Adrienne Barbeau, Ken Mars, Livia Genise, Erica Yohn, and Stephanie Faracy starred. To be clear, neither of these were spin-offs of M*A*S*H. Clearly CBS was inspired by the success of M*A*S*H. I want to say at one point Burt Metcalfe and/or Gene Reynolds were involved in the production of “Handle with Care” but I’m not 100% sure. I haven’t seen either of the pilots, although I’d like to. Between AfterMASH, “W*A*L*T*E*R,” and the two failed nurse sitcoms, there aren’t a lot of serious spin-off ideas left to discuss. If CBS wanted a true spin-off about nurses, the only possible way to make it work would be to transplant Margaret from the 4077th to another MASH unit and build a sitcom around her and her nurses. Do you think anyone at CBS or Twentieth Century Fox gave any thought to crafting a spin-off around Hawkeye as he returns to Crabapple Cove and civilian life? Or Margaret as she continues her military career? Or B.J. as he picks up where he left of with Peg and the kids? Or Charles in Boston, trying to recover mentally from what he experienced at he end of the war? Go on down the line of recurring characters and you can imagine even more potential M*A*S*H spin-offs, each more ridiculous than the last. Kellye in Honolulu, Rizzo breeding frogs in Louisiana, Igor working his pig farm. Prior to the end of the show, perhaps there could’ve been a spin-off about Frank back in the States, ruining lives and making enemies. Maybe Frank and Trapper could’ve teamed up as doctors turned private investigators who use their medical knowledge (or lack thereof) to solve crimes. On a more serious note, I’ve often wondered what AfterMASH would’ve been like if it was a drama rather than a sitcom. The same characters, the same setting, but rather than try to find laughs in the day-to-day operation of a VA hospital, focus on the reality of nurses, doctors, and a priest trying to put men and women who went through hell in Korea back together again. What I do wish is that they took a different approach with W*A*L*T*E*R: let’s see what life on the O’Reilly family farm in Ottumwa, Iowa was like. Unfortunately, in the TV landscape of the early 80s, that wouldn’t have worked . . . those kind of rural, bucolic sitcoms were long gone due to the Rural Purge of the early 70s. Honestly there aren’t any spin off’s that I would have like to have seen, because I just don’t see how any of them could have really worked, and had the appeal to me that MASH did. The Trapper show for instance has absolutely no appeal whatsoever to me, and I have no desire to watch it. Even AfterMASH I really don’t care to watch. I skimmed through the episodes with Radar and Flagg, just out of curiosity but didn’t even care enough to sit through those whole episodes. What I would have liked to have seen, however, would be something that shows all the characters from the show a couple years after returning home, just so we can see how they moved on with their lives. I can’t think of how it would be done other than just a clip show with Clete Roberts interviewing everyone, kind of like he did Radar at the beginning of WALTER. Of course this wouldn’t have worked and wouldn’t be worth the production cost, but it would have been nice to see. Another note, I’m REALLY glad they never moved forward with WALTER. The idea that Radar had to sell the farm and become a cop AND that his wife left him, is just sad and stupid as hell. What about the rest of his family? I guess it’s a continuation of “The Foresight Saga” where the farm is struggling, and the antics of the AfterMASH episode, but still a stupid and sad idea. Maybe a TV movie “The Deportation of Park Sung”. I watched the WALTER pilot and I prefer to believe it never happened. My head canon is that Radar looked up the nurse he met on his way back from R&R in Goodbye Radar, and eventually married her. When the farm failed he fell back on his considerable administrative skills and took a job in the VA. That could have yielded a good workcom with continuity to the original series and opportunities to check in on other characters. I suppose, though, that it’s the same concept as AfterMASH. Exactly, I agree on the WALTER pilot and love your head canon heh. This is the reason some sort of show/movie/television event showing what happened to the characters after they went home, written by the same people who originally wrote the show would have been so awesome. The same could be said for any show with characters you love. For me, I’d like the same for things like Star Trek Next Generation, Voyager, DS9, Friends, and others. It’s just not practical, AKA doesn’t make any money and the actors don’t want to do it. Even though it was a different story with different characters and a different time period, the TV version of “House Calls” felt more like a spin-off of M*A*S*H than any of the actual ones. At least, one more in the spirit of earlier M*A*S*H. That was in no small part because it starred Wayne Rogers as a doctor, of course. I certainly enjoyed that show, partly for those reasons. Imagined spin-off… my less-than-serious answer is a show called “DuringM*A*S*H”, which could just be reruns, though a less facetious way to imagine that is a show following the experiences of the 8063rd MASH unit, following roughly the same time period at that unit. Still, the at-war-in-Korea in a medical unit thing was already mined quite completely. “House Calls” had a couple of other “M*A*S*H”-related cast connections besides just Wayne Rogers. One of the co-stars was Ray Buktenica, who shortly after that show concluded co-starred as Radar’s cousin in the “Walter” pilot. Also, Rogers’ final season co-star on “House Calls” was Sharon Gless, who later played Christine Cagney … a role that was originated by Loretta Swit. None. I would have liked a reunion film catching up with all of them 5 years after the war had ended. A look into their lives and all of them coming together for a lunch or dinner party. Kind of like the dinner party that BJ had Peg pull together while they were all still in Korea . . .
Jamie Farr told me that he had envisioned “AfterMASH” being something more like the film “The Best Years of Our Lives.” So, the comment about the sequel series being done as more of a drama was something Klinger himself seemed to advocate at the very start. That’s pretty hilarious. Would love to see this. Dr. Sidney Friedman is asked to go stateside after the war to continue his work on patients he saw in Korea. While in the VA hospital, we see former soldiers that were treated by him at 4077th. One soldier who has been diagnosed as a serious threat to himself and the general public doesn’t even remember who he is or what he did during the war. He is belligerent and defiant when in session with Sidney. It seems as though Col. Flagg has fallen off the deep end since the war ended. He feels no sense of purpose without a war and his paranoia has taken on new heights. Klinger comes back to Toledo, life goes back to abnormal. The Klinger Collection. Rizzo sells clapped out jalopies on Bubba’s used car lot in the deep south. Rizzo’s Kar Korner. Igor’s, fine dining with a buffet inspired by hot steam and army slop. Who knew? The best spinoffs come from underserved chararcters with interesting twists. All in the Family spun off The Jeffersons and Maude. Perfect Strangers led to Family Matters which turned itself into the show about the nerd next door. Cheers spinned into Wings and Frasier. MASH was done by 1983 so Aftermash and WALTER were just lookbacks vs new and interesting things about supporting characters who we didn’t know a whole lot about. “Tut,tut…Tuttle” — MASH meets “Remington Steele” as Radar and Trapper meet in the states and must keep Capt Johnny Tuttle “alive” for some contrived reason. “Give Me a Blake” — Mac Stevenson stars as Herbert “Honey” Blake, Henry’s Warden brother who is as good a warden as Henry is a commander. I must agree with the consensus that “AfterM*A*S*H” was the most god-awful excuse for a TV show ever concieved! The M*A*S*H faithful deserved something much, much better! In early 1983, Entertainment Tonight polled their viewership asking them if they thought a follow-up series was really necessary, and would they support it. I, at the time, every bit of only twenty-one years old, voted a hearty “NO!! !”, as I realized that a collosal dud was on the way. Naturally, I was right. What an unfortunate embarassment “AfterIM*A*SH” was for everyone unfortunate enough to be involved with it. Conversely, the excellent 1979-1982 CBS series “House Calls” which featured the equally-excellent Wayne Rogers ( rest his soul ) as well as two excellent leading ladies in, first, Lynn Redgrave and, later, Sharon Gless, served as a more potent and enjoyable sequel to “M*AS*H” in that it’s lead character Dr. Charley Michaels ( Rogers ) had a personality that was identical to Dr. John Michaels, with no distinction whatsoever. 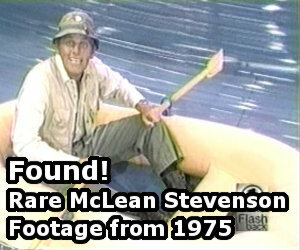 The show could just as easily have been called “The Further Adventures of Trapper John”. Indeed, at the same time as the production of “House Calls”, CBS, apparently eager to milk the M*A*S*H cow for all they could get, was producing a bona-fide sequel to M*A*S*H featuring the Trapper John character called, appropriately enough, “Trapper John, MD” which, with a miscast Pernell Roberts ( rest his soul ) in the lead, just didn’t quite have the feel of a contemporized Trapper John as “House Calls” did. As big as a M*A*S*H nut as I am, I quickly fell out of watching “Trapper John, MD, when I realized that, in spite of the producers’ best efforts, this guy that Pernell Roberts was playing just wasn’t Trapper John from the ol’ 4077th! Charley Michaels, on the other hand, was Trapper, simply transplated to the modern day! ( 1979, that is ) Also, nobody is ever going to sell me on the notion that, even after 28 years, Wayne Rogers is going to eventually morph into Pernell Roberts! No way! Forget it! Why didn’t CBS just re-offer the part to Wayne Rogers???!!! Rogers was quoted as saying in later years that CBS did not approach him over the idea, but that if they had, he would have very happily taken it, realizing as he did by that time that playing Trapper John, MD, was going to be the biggest thing he would ever do! ( apparently learning from the career-ending mistake made by his “M*A*S*H” contemporary McLean Stevenson, rest his soul ) So, instead, Rogers simply took the “Trapper” character over to “House Calls”, and did quite well with it for four more glorious years! CBS at the time thought that MASH should just go on and on.AfterMASH was a cheap dime store attempt to use the three actors who wanted to keep going with the show vs the four who were done. House Calls was so much superior in writing and story, but Wayne Rogers became a hot potato because he had walked off a series. Even Trapper John MD was a better series. Klinger would have been the best gamble for a spinoff. But Jamie Farr would have needed a strong supporting cast, since his acting range was limited. No, MASH was done by season 11. I can’t believe I’ve not thought of this before! I thought of one for Father Mulcahy! All right, so here goes: after that operation that restores his hearing, Mulcahy DOESN’T go to Missouri like in AfterMASH. Instead, he goes back to Philly and rents a home with that he shares with two other people: Father Ryan Lane ( John Dye from Touched by An Angel) a novice, wet-behind-the-ears priest from Mississippi, and Mrs. Louise Adams, thier sharp-tongued, no-nonsense housekeeper (Della Reese from Touched by An Angel ). Life seems good, until…BOOM, a little baby girl is abandoned on thier doorstep, ala 3 men and a baby! Of course seeing as priests have no idea about babies, and the housekeeper is too busy housecleaning to take care of the child, so the priests hire a nanny, expecting a little old lady, but instead it’s a pretty young Irishwoman named Marí Lornagan (Kate Jackson from Charlie’s Angels). From then on, it’s commence: comedic priestly love-triangle. All this is witnessed by the people who live in the two houses beside theirs: Ms. Julia Minchin, the gossippy woman on the left (Katherine McGregor from Little House on the Prairie) and the matchmaking Britisher, Mr. Reginald “Reg” Barnaby the Second (Richard Dawson) who lives on the right. And of course, people from MASH drop in from time to time, Hawk, Beej, Potter, and of course some hilarious visits from our favorite nutcase, Colonel Flagg! How’s that for a spin-off?